“If I’m going to kill a plant I want it to be a cheap one”…spoken like a gardener with Orchid Phobia. Good news! Orchids aren’t expensive or rare any more. They are $10 and up, available in almost every grocery store. They are surprisingly easy to grow…just like we’ve always heard. The easiest orchid to find and grow is Phalaenopsis, the Moth Orchid. This is the one I tried because it thrives in low light with almost no care. Occasionally, when it seemed dry, I plunged the orchid pot in a pan of water until bubbles disappeared… and repeated days when it was dry. The elegant butterfly-like flowers bloomed for many months, not weeks…months. For length of flowering time the Moth Orchid is about as cost effective as you can get. Chives, rosemary, parsley and basil can easily be grown indoors until springtime, giving you fresh cut herbs all winter for winter soups! House grown herbs need about 4 hours of bright light, preferably in your kitchen! A South or Southwest window is ideal. Chives show up as plants in the produce section year round; If not, dig up a chunk in your own garden and transplant to bring inside or have a little fun and grow them from seed. Broadcast the seed over some moist potting soil, water and wait for a mini edible lawn. Parsley and basil are the easiest of all. I guess you could call this cheating. From your favorite grocery store buy a bunch of parsley and a bunch of basil. Strip enough lower leaves to have stems-only plunged into glasses holding a few inches of water. Both parsley and basil last for several weeks if you keep changing the water. Snip as needed. They will eventually form roots. At that point you can either keep changing the water or pot them up. The bonus? Your kitchen smells like you cooked even if you didn’t. “The Culinary Herbal” isn’t your ordinary basil through sage herb book. Those ordinary herbs are well-covered but it’s the oddballs that are the most fun. 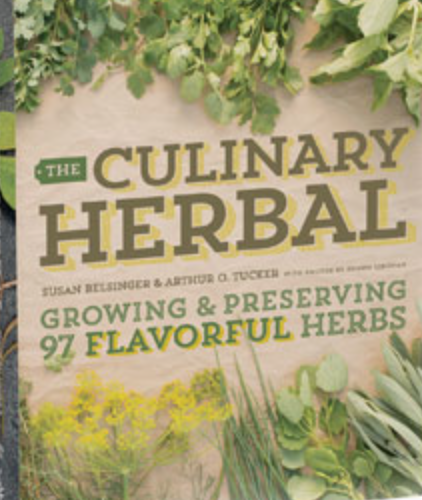 “The Culinary Herbal: Growing and Preserving 97 Flavorful Herbs” by Susan Belsinger and Arthur O. Tucker features both ordinary and extraordinary edible herbs. Wild daylilies, chickweed and stinging nettles are covered along with uncommon herbs like fenugreek, sesame and chicory. Add those to the listed herbs found locally in our South Sound Asian markets and you have a complete herbal reference. All 97 herbal entries are well researched and complete with propagation, cultivation and historical information. But more importantly the book answers the important question, “What do I do with it and how do I cook it?” Herb lovers will find plenty to love about it.